At 888-LOG-GUYS, the staff and crew are the log home experts! 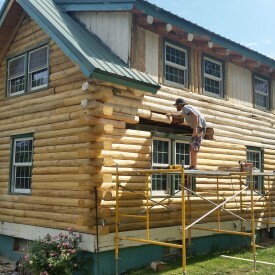 We specialize in log home restoration, log home repair, log home chinking and caulking, log home improvement, and log home maintenance. We are currently serving the Lexington KY area and would love to help you with the care of your home, no matter what it is! Please browse our website to look at our work and testimonials. You can request a free estimate online, or you can give us a call! Our friendly staff is waiting to assist you, so don’t delay! 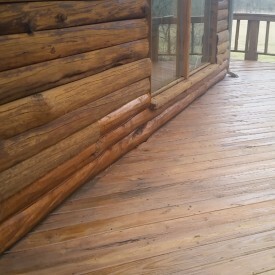 If a log home or log cabin has not been properly maintained, you may notice the stain is peeling, the logs are turning gray, or it may look worn down or weathered. 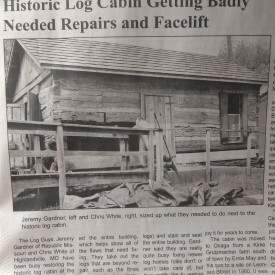 If your log home is like this, ask 888-LOG-GUYS if you need to have it restored. 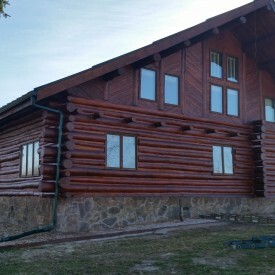 Our crew uses the best products to blast the old stain off (with corn cob blasting, glass blasting, sand blasting, or walnut blasting), sand the logs, clean the logs with a borate treatment, apply an energy seal (chinking or caulking), and stain the logs to rejuvenate your log home! Don’t assume that your logs are too far gone to repair or replace them! Let 888-LOG-GUYS take a look and give you the best solution to your log home damage! Whether you have log rot or holes due to an insect infestation, we can repair your logs or replace your logs that will fit your budget! Our company has repaired or replaced many feet of logs in the over 15 years we have been in business. You can trust us to do the most thorough and professional job of any log home business in the Lexington KY area. Contact us online or give us a call for a free estimate! There is no need to bother with those pesky bugs, air drafts, or water leaks anymore! We can fill in those gaps in between your logs with chinking or caulking to keep out what should stay out! Our crew will make sure your home is a comfortable place to live by applying an energy seal to your log home. And our work is guaranteed to go beyond satisfaction! Please give us a call or request an estimate from our website! It could be said that you have the best log home in the Lexington KY area. However, there may be something you would like to add to make it even better! 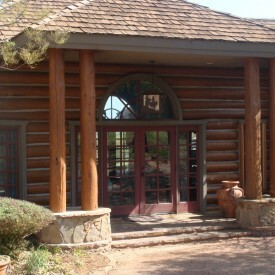 Call 888-LOG-GUYS, and our staff will discuss with you what we can construct for your log home or log cabin. We have built log staircases, log railings, decks, porches, and patios for our clients. 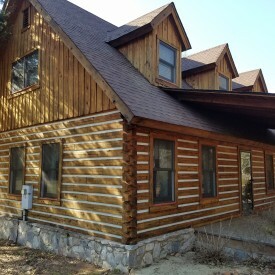 We would be happy to make similar log home improvements for you! If 888-LOG-GUYS professionally restored or repaired your home, you can count on us to be around after we originally served you. Even if another company worked on your home, you can rely on us to be there for you in the long run. We will remind you of when the next cleaning is due for the proper care of your log home or lob cabin, keeping it in excellent condition. If you think your log home needs a maintenance treatment or if you are unsure about when it will be time for your log home to be cleaned, give us a call or you can also request a quote from our website!